I should get out more. : Banksy! I was living in New York City for a couple of months last summer while doing rotations at Memorial Sloan Kettering. One weekend we went to Williamsburg for dinner, which is in Brooklyn, one subway stop past the East River. Williamsburg is still a developing neighborhood, but is a really cool place. If I was going to move to NYC I'd buy a place in Williamsburg if anywhere. Williamsburg is now what the East Village was like 15-20 years ago. Anyway, we were walking into a tea bar (it was my first time going to a tea bar) and I noticed some graffiti on the brick wall outside. I recognized it as being the work of a famous graffiti artist by the name of Banksy, or at least it was a fantastic imitation. In the drawing, there is a man holding a remote control. He is standing in front of a giraffe with a radio collar around its neck, so the man seems to be controlling the giraffe. 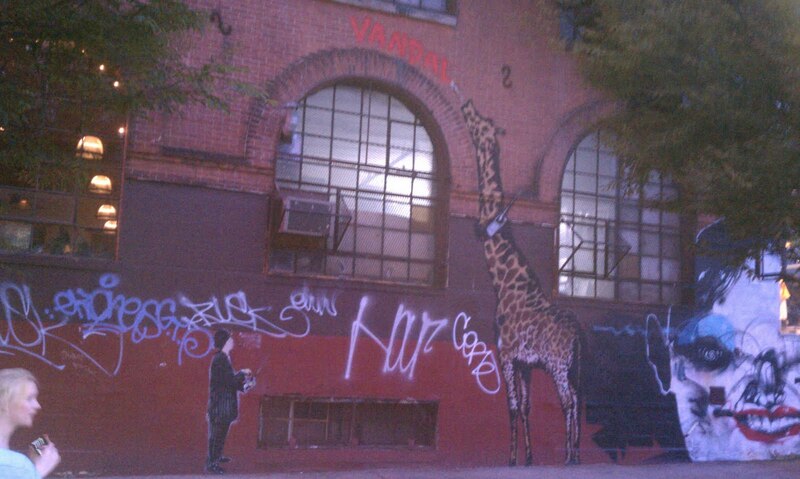 The giraffe has a paintbrush in its mouth, which it is using to write the word "vandal" on a high part of the wall. The theme is classic Banksy, although like I said it could be an imitation.